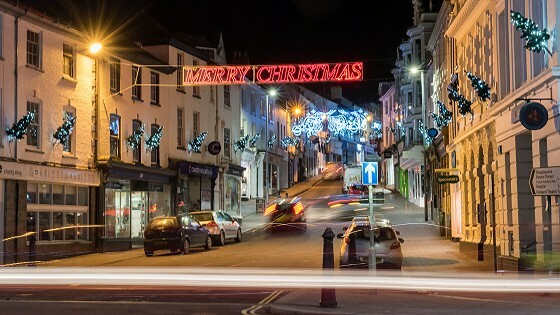 Whatever your vision of a perfect holiday, December brings a special feel to Bideford and many visitors choose to enjoy a break in the town at this time of year. We’ve summed up how you can make the most of visiting historical Bideford during December, combining a stay at The Royal with friendly attractions and stunning countryside. 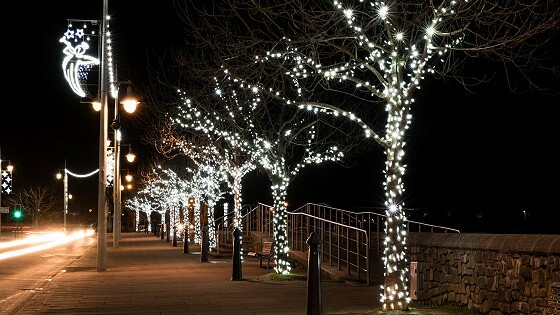 The festive activities in Bideford are growing in popularity year on year. After a big Christmas Lights Switch on (2nd December 2018) there are events and Christmas stalls taking place in the historical market and throughout the surrounding area. Festive cheer radiates from the Christmas decorations that run along the river, up the main roads and along the cobbled side streets. There’s always small things to see and festive fun to be had whilst shopping, as events such as Bideford Town Band playing at venues across town - for example, they are performing at The Royal Hotel on a couple of dates in December. Christmas shopping is a wonder, as decorated shops offer unique products and special souvenir for someone special. Visit Affinity Outlets shopping centre on the outskirts of town for more choice and outlet prices. If nothing else, simply walk along the river by night and you’ll see the lights showing you the way. Away from the idea of shopping, there are many more things to see whilst exploring, and you’ll quickly learn to expect the unexpected in Bideford. The town is an array of features and figures, such as a giant wooden hand holding up a tree, a ring of historical Cannons in Victoria Park, a historical market and Tarka the Otter by the waterfront. This local event is heralded as one of the top ten New Year’s Eve events in the UK. For a small town, Bideford puts on a host of activities. Locals and tourists alike really look forward to this annual event. The streets are closed to traffic whilst visitors dressed in inventive costumes, ranging from vampires and villains to Disney characters, flock to the town centre to enjoy the outdoor roadshow and dancing. It's a firm traditional to see the New Year in with a bang. When staying at our hotel, many guests choose to spend the day enjoying the activities before returning to the hotel for a change of clothes and a delicious meal - the midnight fireworks are then viewable from the hotel, a wonderful inclusion of our New Year breaks. Whilst in Bideford, it’s possible to move from the built-up centre to the quiet countryside with ease. A Christmas break in North Devon wouldn’t be complete without spending time emerged in beautiful surroundings, especially during a refreshing December break in Bideford. So a lovely walk or cycle ride through the countryside, following the River Torridge, is a must do. The famous Tarka Trail runs past the town, an old train track now used to as a walkway through North Devon. Follow your feet until it’s time to turn back, cycle to other towns and popular attractions, or find a quiet spot surrounded by nature to watch the world go by or even fish. Did you know, the Tarka Trail, a part of the South West Coast Path, runs past by The Royal Hotel and is right on our doorstep? Art fans with love North Devon. The Burton Art Gallery and Museum is based here in Bideford, and then throughout the region, there are many galleries and art exhibitions to see. Found right in the heart of Bideford, The Burton is a gallery, museum, shop and cafe that has a range of both permanent and exhibition displays. In December, exhibitions will include Peter Rabbit and Friends with original artworks and manuscripts, The Golden Age of English Clockmaking, and Friends of Burton Annual Open Exhibition with displays from local artists. Travel inland from Bideford and you’ll quickly get to Great Torrington, where the Plough Arts Centre is found. They are the home of plays and films, have exhibitions, workshops, music and talks. They are open throughout December, showing a variety of shows and all types of performance, many based on the theme of Christmas. Ilfracombe is about 40 minutes away from us in Bideford, with sea views and coastal walks. The famous statue of Verity, who’s 66ft tall and looks out over the harbour, is considered to be like ‘Marmite’ - many love it whilst others hate it. Visit yourself to see where your opinions lie. Art and culture meet in magical surroundings. Broomhill Sculpture Garden lies in a beautiful just outside Barnstaple. The gardens have grown into one of the largest permanent collections of contemporary sculpture in the south west of England. They are open in December between Wednesday and Saturday. Open at weekends from the 8th December, The Milky Way has a large undercover area for fun and games whatever the weather. This includes an indoor roller coaster, archery, laser shooting and huge indoor soft play areas. Santa’s Grotto and Elf Emporium will also be available - with the real Father Christmas, gingerbread decorating, Reindeer food making and more. The real Father Christmas must be very busy this year, as he’s also at The Big Sheep this December. He’ll be at Woolly’s Winter Wonderland at the weekends, and having breakfast with families on a Sunday morning. A great grotto will be running alongside Santa’s Magical Light Show and a range of other family fun such as an Ewetopia Indoor Playground, Eweston Station Train Ride, Twister Ride and more. Clovelly is a private village, world famous for its cobbled and traffic-free streets, donkeys, sledges and historic harbour. The stunning views, peaceful tranquillity, old buildings and museums combine to create a vibe of stepping back in time. The fishing village is built into a cleft in a 400ft high cliff, which tumbles its way down past whitewashed cottages festooned with flowers to the tiny working port. Found in Torrington, Dartington Crystal is a leading crystal glass brand and the only remaining factory scale producer in the country. At their Visitor Centre, watch the highly skilled craftsmen shape beautiful crystal, perfecting an art form 3,000 years in the making. The tour of the glass factory allows visitors to get really close in complete safety on elevated viewing galleries and there is a shop, cafe and a gin bar too. At Rosemoor Gardens, everyone can enjoy 65-acres of beautifully planted flower beds all year round. Set within a pretty wooded valley, the gardens are home to plants from around the world, many of which bloom in December. On a Thursday, Friday and Saturday night in December, visit in the evening for their Garden Illumination displays or attend one of their Food and Craft Fairs. An intimate and fascinating Regency house set in an extensive estate. Arlington Court, near Barnstaple, is a National Trust member that’s full of collections for every taste. Arlington's grounds include a formal Victorian garden, a restored walled kitchen garden and acres of informal grounds featuring spectacular spring bulbs and year-round colour. The site is also home to the Carriage Museum. They are decorating the house as a Victorian Christmas and Santa will be visiting as part of their December activities. Discover Bideford in December with us. 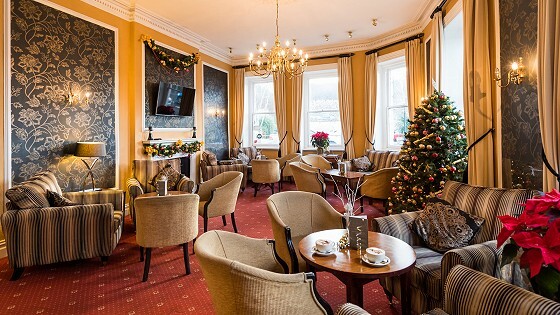 We always decorate the hotel with Christmas decorations and the festive spirit is always in the air, so you’re more than welcome to lounge in a Christmas jumper or silly hat. 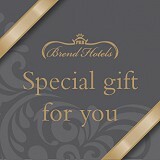 We also have Christmas Breaks available with the option of a grand festive lunch.